A low-noise medium-high voltage generator is always of great use in the laboratory : it is used for the powering of photomultiplier tubes, geiger counters, ionization chambers, solid state sensors for radiation, etc …. However the construction of a component of this type is not simple : sometimes it is better to use commercial products that can often be found at reasonable prices. 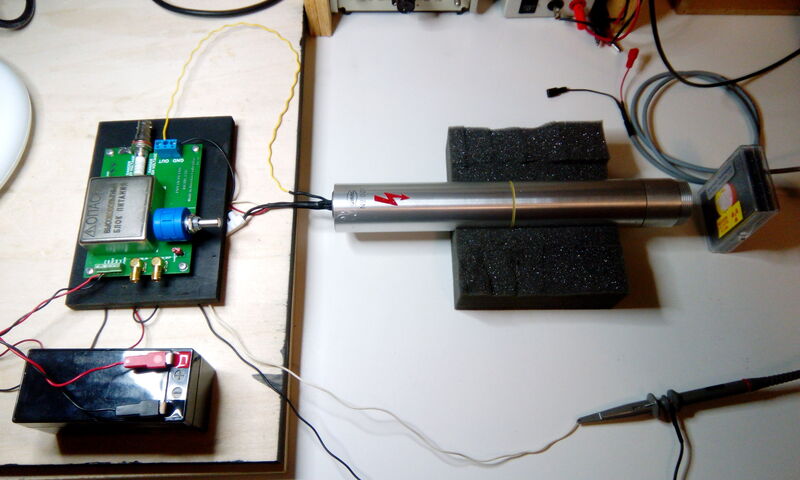 In this post we want to test the HV generator for photomultipliers and for scientific applications produced by the company Micod. 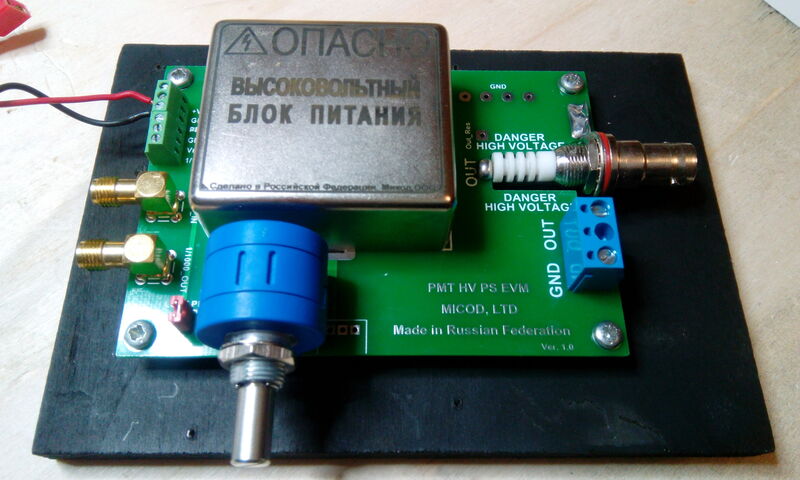 For ease of use the generator is also offered on a PCB prepared with terminal blocks, connectors and multi-turn potentiometer : as you can see in the image above. The generator is the component encapsulated in the small metal box placed at the center of the board. The first impression of the product we tested is to be a high quality product : the PCB has both an SHV connector and a screw terminal block for HV connections, there is another terminal block for power supply, for the External PROG control signal and for the OUT signal that corresponds to 1/1000 of the HV voltage. These signals are also available on SMA connector. There is also a multi-turn potentiometer for the regulation of the HV voltage. 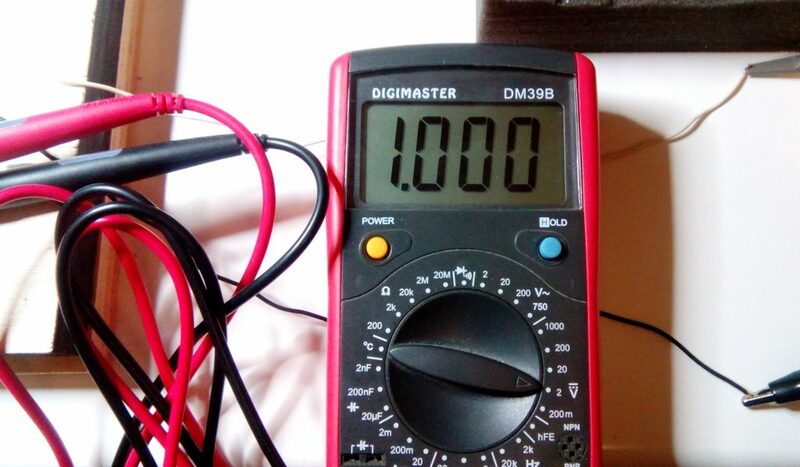 The HV generator has been connected to a 12 V battery and it has been first tested by measuring the voltage generated over the entire range from 200 V to 2500 V. The stability over time of the equipment was also evaluated, setting with the potentiometer a value of 1000 V and checking after a few hours that the set value had remained constant. 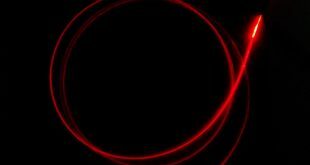 The main application of the HV generator is its use to drive a photomultiplier tube, for example in a scintillation probe. 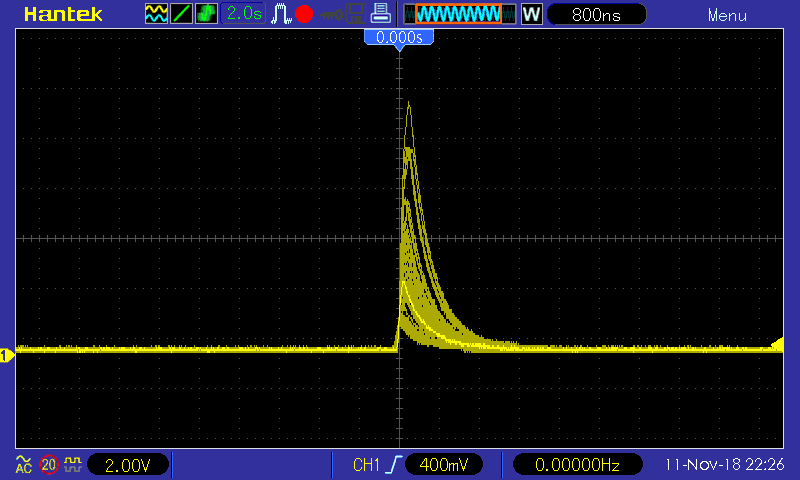 The image below shows the test we did with a GammaTech scintillation probe with a PMT having a 10MΩ voltage divider and a 1μCi sample source of Na22. 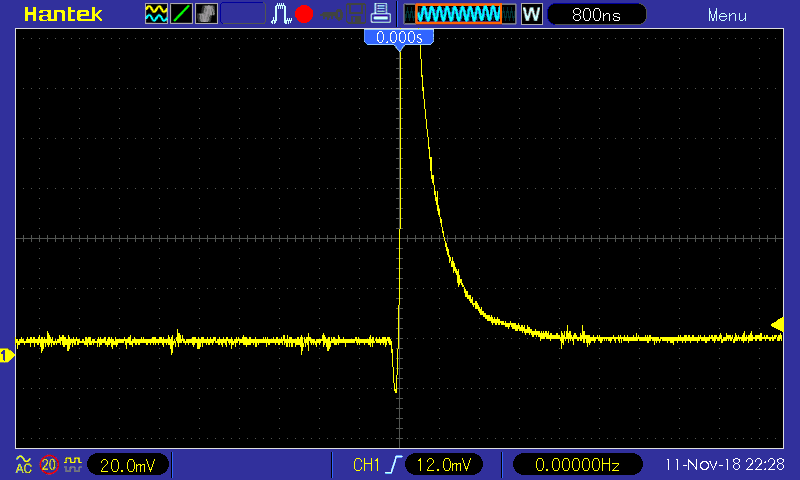 The HV generator was set at around 1300 V and the signal was acquired using an oscilloscope. Inside the probe there is a signal extraction and amplification circuit. The images below show the impulses produced by the detector. In the second image, in particular, we can appreciate the minimum level of noise present on the signal, also thanks to the quality of the HV power supply. The tests carried out highlighted the excellent behavior of the Micod HV generator. The small size of the electronics and the versatility of its features allow it to be easily integrated into many applications where medium/high voltage generation is required.